In Submarine vs Invaders, the alien monsters have plans of taking over the ocean. As the guardian of the sea, you are equipped with the latest light speed submarine, claymore, nuclear beam and weapon upgrades. Fire these weapons at will as you manoeuvre your submarine around enemies' attack. Do whatever it takes to take down the gigantic monsters. Hurry, crush these aliens & monsters in this action filled battle before they take over our seas. 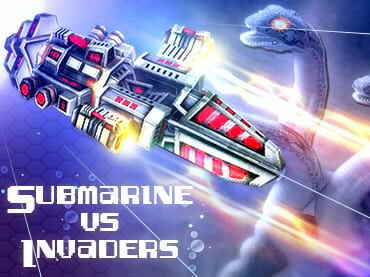 - Submarine vs Invaders is a free full version game to download and play. If you have questions about Submarine vs Invaders game, please contact us using this form.